One of my most popular posts is about improv and marketing. Having just finished up my final class at Voodoo Comedy Playhouse in Denver, I thought it is time to discuss improv and sales. While I am not a sales reps, I have been involved in complex B2B sales cycles for over 15 years, and currently, sell consulting services. As such, I have a good bit of insight on selling and the sales process. “Yes, and?” is the core concept of improv. The essence of it is to say yes to an idea and then build on it. In an improv scene, maybe one improviser indicates that you are siblings, to “yes, and” that would be to say they are not only siblings but sibling best friends. And then build further on it. And this is a lot like sales, because who doesn’t want to hear “yes, and” when they are in sales? This absolutely applies to sales. I am not suggesting to not have agendas or reasons for your call, but what you need to do most is listen. Walk into the conversation and make your introduction. Then listen to how your prospect or customer responds, and then react off of that. If they want to talk about something different, why not engage in that conversation? And look for cues and then react to those cues. What you don’t want to do as the quote says is go in with your fixed idea, and spout that regardless of what the buyer says. Oh, and a good sales enablement tool can help you do just that. Check out this post on the matter. Another key thing to do in improv is to mirror. At the start of a scene, a stock go to is to do exactly what your partner is doing. This is called mirroring This puts you and your partner on the same page. It supports them, and they feel good about the scene. It is a great place to start. There is quite a bit about the use of mirroring techniques that drives effective conversations. And this is the case in sales. Copy the body language of your prospect. Use their terms. This is incredibly effective! If you aren’t already doing it, give it a shot. Don’t feel bad if you aren’t natural at this. While it is hardwired into our brains, I personally find it difficult to do. In improv, if you don’t have the energy you can’t expect your crowd to have it. They are going to feed off of you. If you go out and have really low energy, you know what, they will have low energy. Same is true for a sales call. Have a smile, have some enthusiasm and it will usually spread to them. There is a real problem in Improv. In that, often times you will get a bunch of people just standing around talking and not doing anything. You can go to many places to see people just stand around and talk, no need to pay to go see a show. Improvisers should be doing something on stage. Same is true in sales. You shouldn’t just be talking. You should be doing something! Most notably you should be showing your product. This is especially true in the cloud. Do a demo, show your prospect how you (or your company) use the product. This is much more interesting than you just standing up there talking. If you can’t show your product, things like workshops or brainstorming sessions are also really cool ways to make a conversation memorable and productive. Back to yes, and? 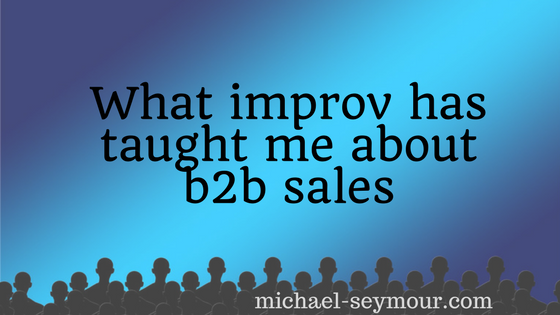 Well, what do you think about improv in sales? I would love to be here your yes, and on this. Hit me up via Twitter, or via the comments. Hello there! Someone on my Twitter community shared this informative website with us therefore I came to take a look. I undoubtedly love the information. I am bookmarking and will be tweeting this advice to my followers! Excellent blog and outstanding layout.